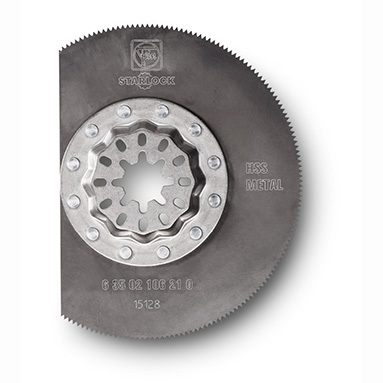 FEIN MultiMaster blade - HSS segment saw blade Ø 85mm. Cut plastics, fibreglass, wood, putty, non-ferrous metals and sheet steel up to 1mm thick with this carbide segment blade. It's free of burrs and non-warping and minimises the amount of flying sparks - without complicated touch-up work. Ideal for working in corners. Blades supplied individually (not in blister packs).